Signed for £80,000, and joining a club in the process of winning back-to-back Premier League titles, with Jose Mourinho, Didier Drogba and Frank Lampard to provide inspiration. It is fair to say Cameron McGeehan was not your average 10-year-old footballer. Dreams did not turn into glory at Stamford Bridge, but a decade later, and playing first-team football every week in League Two with Luton Town, the Football League's Young Player of the Month award for February proves McGeehan is making strides back towards the top of the game. Looking back, the midfielder, still only 20, takes a mature view of why he, like many other youngsters, failed to make the grade at Chelsea. "At 13 or 14 you become more aware of your surroundings," he told BBC Sport. "You start to think about it more, you get a bit of an ego and that's what naturally happens. "There are a lot of players at Chelsea like that, with egos, and I don't think it's the best thing for young players. "It can be damaging, you forget why you're there, why you're trying to work hard every day." In an era when young players can move for multi-million pound transfer fees and earn tens of thousands of pounds per week, it is almost impossible for teenage footballers not to get carried away with the potential riches on offer and the fame that will inevitably come with being a Premier League star. "When you're playing for a top team and you're going to school, all your mates keep saying 'oh you're play for Chelsea, that's cool'," said McGeehan. "Social media amplifies things even more, to the point where it's very damaging for young players. "The money is now getting a bit ridiculous for youngsters who haven't even stepped foot on a first-team pitch." The pivotal moment in McGeehan's youth career came with a move to Norwich City. An honest chat with academy manager Neil Bath highlighted former Chelsea youngster Andy King - now on the verge of a Premier League title with Leicester City - as an individual who had been in a similar position and chose to continue his career elsewhere. "Neil said I might be better off going somewhere else and finding my way rather than staying," McGeehan said. "He said I might get a contract [at Chelsea] but I might get lost." McGeehan's decision to continue his football education with the Canaries paid off, as he helped them lift the FA Youth Cup in 2013 - scoring in both legs of the final against his former side. "I wanted to go to Norwich, play and learn the game that way and get away from London to find myself," he explained. "It was a bit like when an 18-year-old goes to university to find themselves. The university of football for me was at 16. It was a big decision but I'm very glad I did it." Despite his success at youth level with Norwich, McGeehan once against tasted disappointment as he failed to break into their first team. After loan spells at Luton and Cambridge, a permanent move to Kenilworth Road gave him a chance of the regular senior football he craved to showcase his abilities. 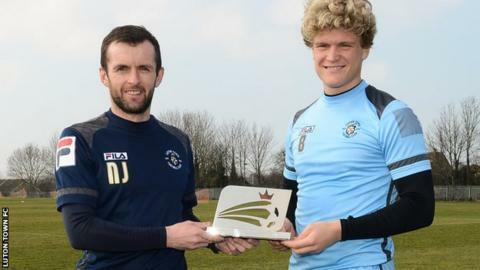 McGeehan scored three goals in Luton's five games in February to earn the award, which has previously been won by the likes of Dele Alli, Charlie Austin, Patrick Bamford and Wilfried Zaha. "It is amazing to be in the same sort bracket as those players," said McGeehan. "They are the sort of players, like Dele Alli, who open the door for every other young player - showing them what it takes to play in the Football League and then go on to hit the heights of scoring for England against France." He continued: "It's been an interesting season for me. It's my first season in the league, I've never seen what it's like to go in every day and how long a full season lasts. "(Previous Luton manager) John Still brought me to the club and helped me a lot, believed in me and gave me my first chance. "Nathan Jones came in and he's been unbelievable for me. He's a young, hungry manager and matches my ambitions for my career. "He pulls me to one side a lot and helps me and that's what I need as a young player, I need to be nurtured and loved - that's how a young player can progress." Keeping up with the Jones way? Having tasted life at two top-flight clubs before dropping down to League Two, Jones has no doubt about McGeehan's potential to make the opposite journey in the years to come. "He's definitely got the type of character that I want from our players here," he said. "A lot of people come from big clubs or Premier League clubs and can't handle this side of the league - the difference in facilities and the style of the league. "Cameron is a self-motivated player. He trains hard, has the desire to do well and listen. He has the ability, attributes and desire to play at a higher level. "How far he goes depends mostly on him. What we hope is that Cameron's career and Luton Town go forward together."